Every nerd has something they collect. Some try to track down every issue of their favorite comic book, some relish rare video games, and others are simply satisfied with collecting themselves after a brutal de-pantsing. I collected the work of Dr. Seuss. Growing up, my bookshelves were filled with all number of works by Seuss, both under his usual monicker and pseudonyms Theo LeSieg and Rosetta Stone. I had rare books like his risqué adult novel The Seven Lady Godivas, collections of his World War II-era comics and advertisements and a copy of his terrible movie, The 500 Fingers of Dr. T. My father would back-order out-of-print works for me, and my favorite place to visit was the book store. So, needless to say, How the Grinch Stole Christmas! was the only special that fully suited my youthful Christmas needs. 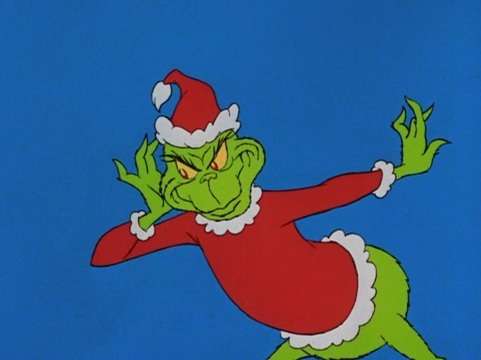 Like most of Seuss’s books, How the Grinch Stole Christmas! outlined an important message: Christmas doesn’t come from a store; it comes from the warm feelings of those we care about, and a sense of fun and togetherness. Christmas day is in our grasp, as long as we have hands to clasp (sorry, stump-o’s). On its surface, it’s a sentiment that doesn’t look like much. Of course, with the wonderful rhyming patterns, made-up words like “chimbley” and winning illustrations, it wasn’t hard to make the message a more appealing one. But as a Seuss-o-phile, this resonated to me on a different level. Seuss’s stories were generally allegories for big, important things – Yertle the Turtle is Napoleon or Hitler, Horton Hears a Who is about the bombing and occupation of Japan (and dedicated to “My Great Friend, Mitsugi Nakamura of Kyoto, Japan”), The Butter Battle Book is about the Cold War. Why place the meaning of Christmas alongside such incisive analyses? Religiously, I grew up in a household that none of my largely Christian schoolmates could fathom without a few questions. My mother was raised Episcopalian, but I don’t remember her ever being religious. My father is Jewish, but again, not very religious besides observing the high holy days and Hanukkah – though even the former practice began in my adolescence. Every year, we celebrated both Hanukkah and Christmas. I have fond memories of decorating our Christmas tree and lighting our menorah, illuminated as it was by an array of Christmas lights. I called myself a “reform Jew”, but I think all along I knew I was atheist. No matter how hard I tried to convince myself, I did not believe in God. Even without going to church every Sunday, God was assumed to exist by everyone around me – and, thus, that I believed as well. I sat by while friends called other friends “stupid” for not believing in Him before I was out of the atheist closet myself. I was surrounded by Christianity in my suburban Texas town. Churches were everywhere. A girl that I liked was baffled by my disbelief in the miracles of Jesus. I uncomfortably sat through an assembly that was described as a talent show for teachers, where one instructor gave a brief but passionate Evangelical sermon. The Daily Show came to my hometown to interview members of a group who, in reaction to the building of a mosque, held pig races on Friday nights. A barbecue restaurant I drove past every day was in the news a few years ago for its refusal to take down a graphic image of an Iranian man being lynched. It wasn’t hard for me to develop some mixed feelings about religion, and subsequently about Christmas. Doctors told me that my heart was dangerously close to shrinking three sizes. 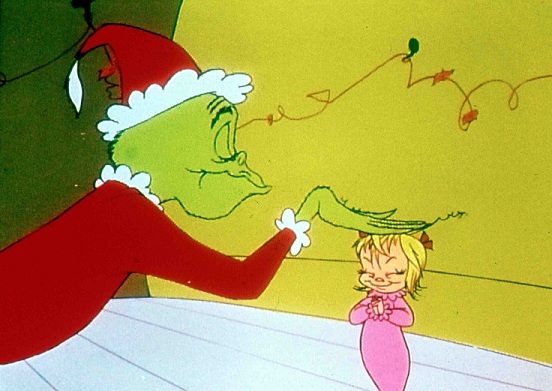 How the Grinch Stole Christmas!, the TV special, brought the wonderful world of Dr. Seuss straight to America’s sets every year, and that was a special thing for me. Without having something like that, I may have become a much more bitter person than I did. It brought the story to life, and it didn’t need Jim Carrey’s signature jumping and screaming to get it done. It only expanded on the kernel of goodness that was the original novel, along with the memorable voice acting of Boris Karloff and the chasm-deep tones of singer Thurl Ravenscroft, also known for his famous portrayal of Tony the Tiger. It also gave color to the world of the Whos, whose existence in the book was originally limited to Seuss’s stylistic choice of only including the color red. For the budding literary geek I was, turns of phrase like “you’ve got termites in your smile,” “your heart’s a dead tomato splotched with moldy, purple spots” and “your soul is an appalling dump-heap overflowing with the most disgraceful assortment of deplorable rubbish imaginable, mangled-up in tangled-up knots,” stuck in my memory and inspired me to create fiction of my own. 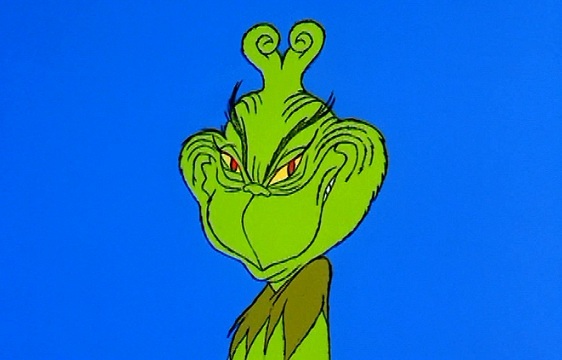 But let’s return to my original query – why would a Christmas special be written by Dr. Seuss, whose most accomplished pre-children’s work was his co-authorship of Design for Death, a 1947 Academy Award-winning documentary about World War II and the occupation of Japan? As a child, however, my reverence for Seuss assured me that I ought to trust him on this one, to enjoy Christmas in spite of my schoolmates’ bemused bafflement at what they considered a devastating personal flaw in me. I was reminded to not get too annoyed by the constant barrage of carols every time I went to a store, and to remember that Christmas doesn’t have to be about religion – it can be about togetherness and love. And it reminded me that not everyone who had faith was the barbecue bigot down the street. Today I fully identify as an atheist. And yet every year, my wife and I set up our Christmas tree, deck our halls and watch Christmas special after Christmas special. The Grinch may have tried to steal Christmas, but he gave me a very important gift – an understanding that even though the world isn’t perfect and that there will always be closed-minded people, Christmas should be a celebration of what we have in common, not a magnification of our differences. Thank goodness I have hands to clasp. Tomorrow: Spend Christmas Eve with Ebenezer. No, not that one. Zach, this is a fantastic writeup. Thanks for sharing. It’s grr-RRR-EAAAAT!! !